Testing the merits of a truly stupid art trial. As many of you who put up with me in real life know, I’ve been obsessed about the Peter Doig art authenticity case for over a month. So obsessed that when it was finally over, I wrote a short piece for Apollo trying to express how strange it is, from a number of disciplinary standpoints, that a living artist had to *prove* in a court that he didn’t paint a painting or face millions in penalties. In my original email rant, I connected the case to various other artists denying works and the implications of courts (not the artists themselves) being the arbiter of what is and isn’t authentic. But I think this is bigger. I can’t help but see connections to other cases. Like, how much control does a living artist have over works they have produced? Can they disavow them (as some have done)? Can they destroy them? Is it for the courts to decide? Do we have a special category of subownership for living artists? We’ve created this art market which works best for dead artists. Living artists are just like some weird extra appendage. They cause problems. 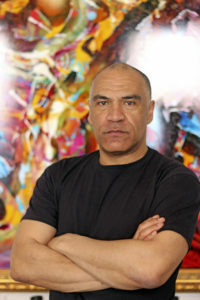 Kevin Sharkey doesn’t deny he destroyed some of his own work. He claims it was his, someone else claims they owned it. Can he do that? Clearly Sharkey can light paintings that he *owns* on fire…but can he light paintings that someone *else* owns, but that he created, on fire? Probably not, but why not? The Doig case is different. There isn’t any sort of theft involved, just attribution of a painting and a shameful, frivolous lawsuit that should never have reached a courtroom. Move away from all that sociology and implication prattle, this case was just dumb. What, good gosh, was the judge who let this in thinking. I honestly googled the fella to see if he was totally wacko. He seems ok… I think that is one of my more visceral issues with the Doig case: that US tax dollars kept the lights on in the room while pure stupidity was trotted out in front of a bunch of people who were either total innocents (Doig and his family) or innocent and in mourning (the deceased Pete Doige and his loved ones). Nothing like making the sister of a dead man cry in public because you are that hell bent on extorting a famous artist with a similar name. Because this really hinged on whether famous, rich artist Peter Doig was not a 16-year-old high-school student in one part of Canada who had yet to start painting in 1976, but was in a detention centre in another part of Canada painting and signing his work, for some reason, “Pete Doige”. No “r”, with “e”. 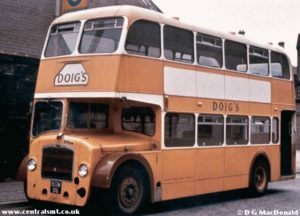 All aboard the Doig bus. NO DOIGES ALLOWED. Thankfully I live in Scotland where I could test, to some degree, the merits of this case. I decided to conduct an experiment, an experiment into “Doig-ness”. My good friend, and often collaborator, Gavin Doig (no relation…SO HE CLAIMS) was pressed and jostled into answering a series of questions related to the case. My first question: have you ever, even accidentally spelled your surname “Doige”. Response: a clear no. Never. Clearly, as the plaintiffs in this case did, I considered that to be suspicious (even though I’ve never spelled my name Yeats by accident), because it behooved me to do so. “How,” I pointed out, “Can I be sure you didn’t have an “e” on the end of your name when you were 16″. AHA! GOT HIM. Within about 3 minutes my test subject sent me a copy of an expired passport from his teenage years. No “e”. But like the plaintiffs I found THIS suspicious. What was he doing with so much information about his past just lying around in his flat? Why could he dig up that passport in moments? Clearly, any evidence that disproves my theory is probably fake. So I declared it probably fake and suggested an uncle of some sort (who Gavin insists is NOT PETER DOIG) sat for the picture, just like the Doig trial plaintiffs suggested Doig’s brother sat for the artist’s 1976 yearbook photo. Thus, I determined that I would likely need to speak to Gavin Doig(e)’s mother, his sisters (like in the Doig trial), and then toss whatever they say. 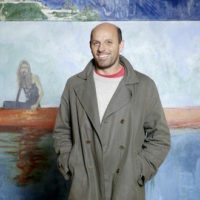 I’d probably need to talk to Peter Doig and his mum too. I ended the experiment there because I know Gavin’s mum and I think she’d probably think a call from me about this was a bit funny but mostly crazy. Now I am just back to interrogating why he denies Peter Doig is his uncle. You have only one uncle and it isn’t Peter? Sure.